Search for the best flight prices from Manchester to Lourdes. Compare prices, book today and save money with Manchester Airport. This town in the French Pyrenees is home to one of the world’s most significant Marian shrines, where hundreds of thousands of pilgrims gather every year to mark the appearance of Mary to young Bernadette Soubirous (now St. Bernadette) in 1858. Filled with sacred sites, it’s a deeply spiritual and moving place to come and reflect, whether or not you want to take part in the daily masses and candle-light processions. A destination of two halves, Lourdes is divided into the spiritual area on the banks of the river and the original peaceful market town. Most of the hotels are gathered around the centres of pilgrimage, with five-star Grand Hôtel De La Grotte (66 rue Grotte) situated right by the famous Grotto of Lourdes. The town has comfortable mid-range accommodation in abundance – Villa Mariale (15-17 avenue du Paradis), overlooking the Gave River, has its own fitness suite and sauna, while Hôtel Panorama (11-13 rue Saint Marie) offers free visits to the Notre Dame sanctuary. A selection of self-catering apartments provides accommodation for budget travellers. Résidence Bellevue Sanctuaire Must Appart (60 rue de la Grotte), a short walk from the grotto and sanctuaries, is among the best. The shopping scene in Lourdes is overwhelmingly dominated by souvenir shops. Palais du Rosaire (83 boulevard de la Grotte) is the largest and most unapologetically kitsch of these, and its huge stock of religious memorabilia makes fascinating browsing. If you aren’t in line for a Virgin Mary fridge magnet or a saint statuette, then the covered market at the Place du Champ Commun also sells a variety of more traditional produce, including locally sourced fruit and vegetables. Monoprix supermarket (9 place du Champ Commun) stocks all the basics for self-caterers, and Book Shop (13 rue du Bourg) in the town centre has an impressive collection of Lourdes-related titles. Look beyond the tourist canteens and Lourdes has a good selection of characterful local bistros. Le Luma (23 avenue du Général Leclerc) is a sweet little place, which packs plenty of charm into an impossibly tiny area. The excellent-value menu means it’s regularly full to capacity, but if you can’t find a table then Restaurant le Magret (10 rue des Quatre Frères Soulas) is a good alternative. The chef here works wonders with local specialties such as duck, cheese and pork, and the rustic décor just adds to the atmosphere. Vegetarians should head to nearby North African restaurant Le Soleil (8 rue des Quatre Frères Soulas), which serves creative and tasty couscous-based dishes. An international crowd of classical musicians descends on Lourdes for this spring music festival. The 2013 edition focused on well-known Baroque composers such as Scarlatti, Handel and Bach. If you’ve always fancied picking up pottery or trying your hand at needlework then this is the place to start. The festival incorporates a programme of workshops and talks, as well as a bric-a-brac sale and selection of food stands. This brand-new festival is aimed at auto enthusiasts of all ages. It combines an exhibition of antique cars with a display of old engines and plenty of fringe activities. The show takes place over the course of a day at Tydos Covered Market. Ten days of theatres, concerts and exhibitions make up this buzzing annual festival, which is focused around the prestigious Prométhée short story prize and the Max-Pol Fouchet poetry prize. It concludes with the ‘Journées magiques’ – a magical programme of live entertainment. 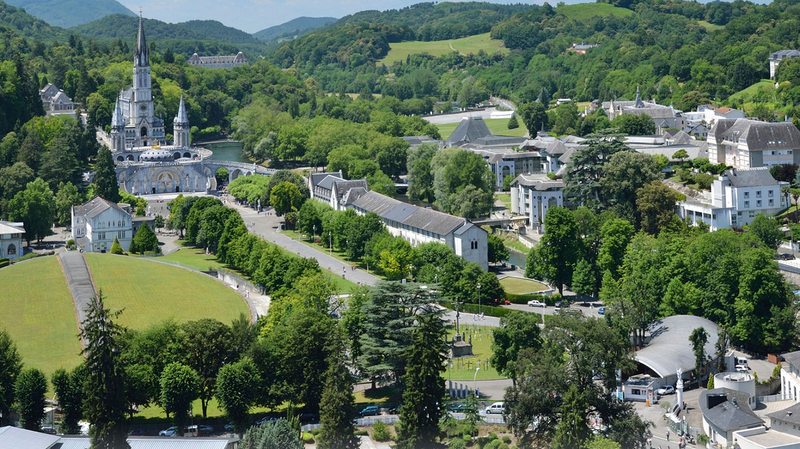 Lourdes takes its festive preparations very seriously, and throughout the months of November and December, the region hosts a series of performances, street art, family film screenings and walks. The ice rink on Place Peyramale is the main Christmas attraction.